For the past 20 years Alf Grubb has planted trees – Not just one or two, or even a dozen to line the driveway – but literally THOUSANDS! Working with Saugeen Valley Conservation, Alf Grubb, owner of Buddsteel Architectural Products Ltd. has been distributing White Spruce seedlings to local citizens committed to planting trees in honour of Earth Day! This year was especially poignant. During the winter Teeswater lost one of its finest citizens, long-time Hillcrest Central School office manager Lois Ballagh. Calm, professional, with an ever-present smile, Lois was often the first person generations of new students at the school met. One of Lois’ ‘pet projects’ was the renovation and refurbishing of the school library. Seizing on an opportunity, Elaine Fischer (Alf’s daughter) contacted Wendy Kolohon, Principal at Hillcrest Central with the idea of selling seedlings as a fundraiser for the *NEW* Lois Ballagh Library! 180 seedlings will be sold by Hillcrest Central students to raise money for the library. What goes around, comes around. Trees are cut down to make the paper that will end up in books. Sometimes though, trees are planted to help create libraries to hold those books. 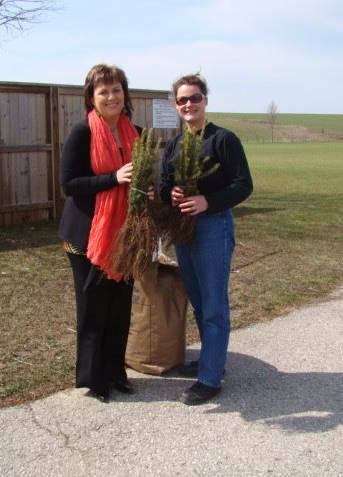 Buddsteel, Saugeen Conservation Authority and Hillcrest Central School – working together to plant futures.